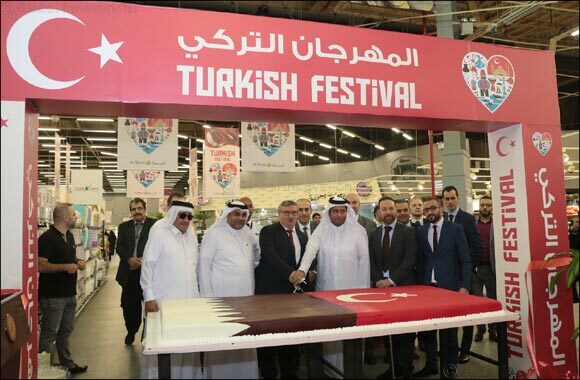 Doha-Qatar, October 24, 2018: Al Meera Consumer Goods Company, in keeping with its commitment to enhance cross-cultural ties and to celebrate the growing friendship and business between Qatar and Turkey, is hosting Turkish Festival from October 24 to November 6, 2018. The festival was launched at Al Meera Hyatt Plaza on October 24, 2018 in the presence of Sheikh Thani Bin Thamer Bin Mohammed Al Thani, Al Meera Chairman, Ambassador of Turkey to Qatar HE Mr. Fikret Özer, Mr. Abdallah Bin Khalifa Al-Kuwari, Director of Supply Department / Quantitative Licenses and Market Control Department at Ministry of Economy and Commerce and Mr. Didier Castaing, Al Meera CEO along with Al Meera Executive Directors. During the festival, guests will be able to get accustomed to the Turkish heritage, culture and regional cuisine. Customers will get to visit the Turkish extravaganza such as bakery, dairy products, dry food, juice, etc. All the Al Meera branches would infuse the Turkish look and feel and will have special Turkish culinary delights on display such as Turkish ice cream shows and Turkish coffee and Turkish delights. Al Meera plans to have similar other festivals in the coming months.